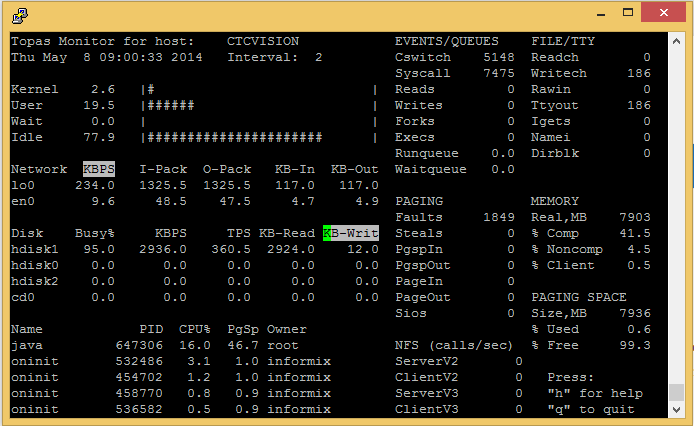 An easy way to get a quick overview of system performance on an AIX server is to use the topas command. The topas command reports selected statistics about the activity on the local system. The command uses the curses library to display its output in a format suitable for viewing on an 80×25 character-based display or in a window of at least the same size on a graphical display. The topas command requires the bos.perf.tools and perfagent.tools filesets to be installed on the system.